Jura Bean-to-cup machines for office - Guest House - Show rooms - restaurants - offices. The Jura range offers no hassle, no fuss coffee at the push of a button. This easy to program machine comes with a built in grinder, milk frothing capability and Swiss made quality. The E8; WE8 and the smaller E6 are the latest in coffee machine technology. Enjoy easy cleaning and maintenance; years of service and your favourite coffee brews such as cappuccino, flat white or cafe latte at the push of a button. No trained staff are necessary as this state of the art machine is easy to operate. The Jura E8 is designed to operate efficiently in a small to medium business environment and is ideal for the smaller accommodation establishment, show room and salon environment. While we would recommend other options for a dedicated coffee shop, the Jura E8 will hold it’s own in any restaurant or whereabouts where customers want to enjoy good quality coffee with little fuss. 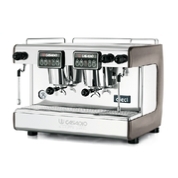 We stock a comprehensive range of traditional coffee machines from the renowned Italian manufacturer, La Cimbali. From tampers and tamper mats through to grinders, machines and detergents. We offer those wanting to serve coffee professionally, be this a coffee shop or restaurant, an opportunity to hire these, or rent to buy over a thirty six month period. Please take a few minutes to complete this form. We literally have hundreds of items in our range and, by being supplied with accurate information, we will be able to find the best match for your needs and requirements. We hereby undertake to keep all your information 100% confidential and not to pass this on, for reward or other use of any nature to any third party. We request your permission to send along a monthly coffee newsletter or link to our magazine section. They have indeed - this is largely due to the weakness in our local currency. So what do we do, stop drinking good coffee? Not likely! As if this wasn’t enough, these have also become engineering masterpieces and are now extremely efficient. Yes, there are still some cheap and nasty machines around, take a look at any supermarket and you will see many. Please don’t be misled by a brand name…rather take a look at the price and accept the principle that you will be paying for what you get.it will be a better product and last you for many years. At our own guest house, we have been through the cheaper options, these tend to last a year or two at the most before giving you problems…when they do, who fixes them? Is there a local service and repair centre or do you give it to someone over a counter and hope for the best? We have done this all for you. After giving the matter extensive investigation, even so far as inspecting their premises and their workshops, we have formed a professional and trusted relationship with a few suppliers who we feel meet our demanding criteria. Frequently asked questions; Support SA business; Coffee origins; Artisinal coffee; Coffee roasting video; Blend or single origin; Roast types; Coffee drinks; Coffee tasting; Jura automatic coffee machines; Filter machines; Espresso machines; Stove top machines; Coffee machine rent or hire options; Buy coffee online; C&H Signature Blend; C&H Roasters reserve; About our online club; Coffee grinders; Barista guidelines; Extracting flavour; Acidity or bitterness; Contact us. If ou don’t see what you are looking for on this page, please contact us. We have over 300 items on our books and will assist you in selecting what is best suited for your application. It might not suit you to spend a large amount of capital on the full purchase of a coffee machine. Hiring or renting this on a monthly basis can be a suitable option - this becomes a monthly deductible expense; it is easy to allow for and your available cash resources can then be used for other reasons. Subject to certain terms and conditions which will be clearly laid out in our rental contract as we go forward, you are able to rent a machine on a monthly basis. If you continue the contract for an extended period of three years (at your sole discretion) the machine becomes yours. If you decide to purchase as the rental rolls along, you can do this at any time and a portion of the rental paid to date will be deducted from your purchase price. How easy is that? We rent out the Jura automatic machines as well as the and the La Cimbali traditional espresso machines. Please complete the form below and we will help you match up with the most suitable machine for your application.